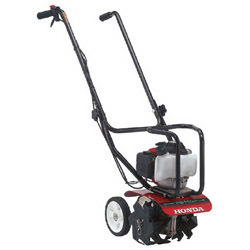 The Honda FG110 Tiller has an easy-starting mini 4-stroke engine and is less than 29 lbs for easy maneuverability and mobility. The FG110 has a 9" tilling width and hybrid tines for unsurpassed performance. This model also has the fastest tine speed, at 294 rpm. Optional attachments include aerator, edger and digging tines.